Dishwashers are an ultra-convenient appliance that most of us have come to rely on in the modern world. Until 1997, dishwashers were all the typical floor mounted variety with drop fronts doors to access the interior racks. That year, Fisher/Paykel introduced an exciting new dishwashing product called the “dish drawer”. The dish drawer variety is a bit smaller and slides out like a file cabinet drawer. The dish drawer was an immediate hit, and many thousands were installed in new kitchens around the world. Twenty years later, homeowners are still attracted to the latest generations of drawer dishwashers for the convenience and flexibility they offer. 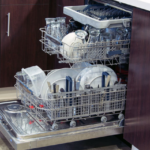 Drawer dishwashers are available in single, or two-drawer models. Single-drawer models are useful in small kitchens with limited space as they are half the size of a normal dishwasher. The larger two-drawer models allow you to operate the drawers independently. For instance, you can use a single drawer for small loads or run both drawers for larger events. The two drawers also allow you to separate your dishes, placing more fragile items in one drawer and pots and pans in the other. My wife likes to use one of our dish drawers strictly for delicate wine glasses. Having the top drawer located just under the countertop eliminates the need for bending, making it much more convenient for anyone but especially those with back or knee issues. Two single drawers can be installed side by side. 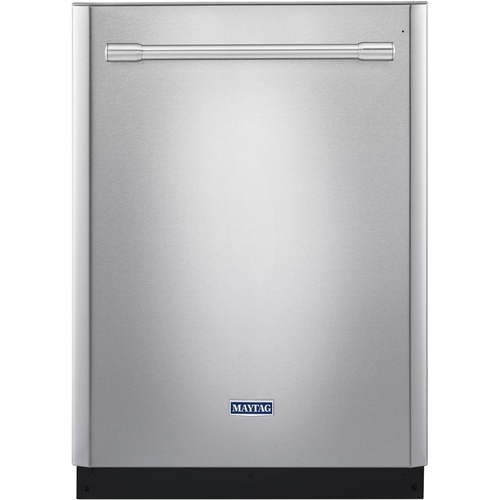 In a standard dishwasher the door drops down, taking up space in walkways. This is especially problematic in smaller kitchens. 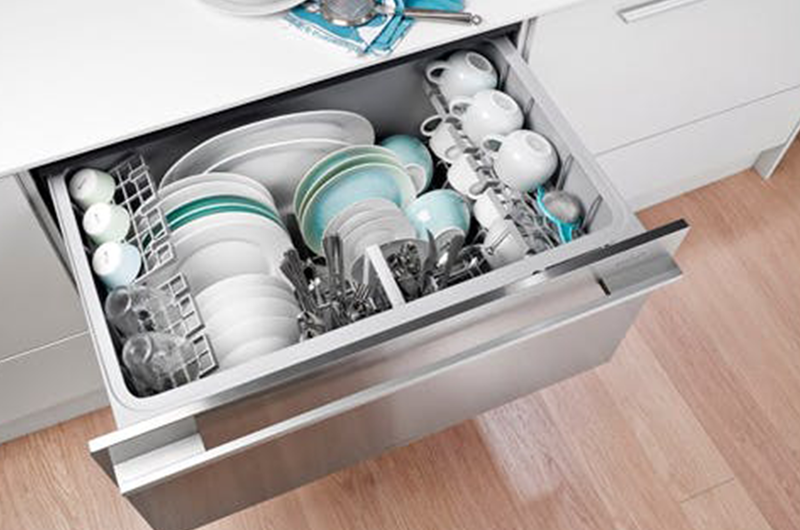 Drawer dishwashers pull out quickly like a regular drawer and can be opened only as far as needed for access. A two-drawer dishwasher very conveniently requires the exact same space for installation as a standard undercounter dishwasher. For smaller kitchens you have the option of purchasing a single drawer, which is only 16 or 17 inches high. The combined capacity of two drawers is surprisingly similar to a standard dishwasher. Each drawer can accommodate about five place settings. In a larger kitchen, the drawer gives you lots of options. You might choose a two-drawer model and add an extra drawer in your kitchen island or pantry for additional space. Drawer dishwashers on average are more expensive up front than most standard models, depending on the brand and features you select. 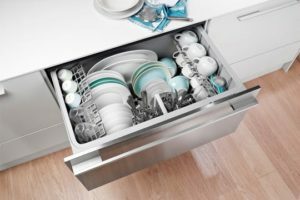 But you will gain back some savings as running a drawer dishwasher will use approximately one-half the water and electricity compared to a standard dishwasher.